Some of these subheadings might sound very depressing and daunting, but in order to grow and evolve into people we really want to be, it is important to realize that it takes time. It takes books. It takes struggles, but what we do when we find ourselves struggling determines our happiness. Oli Doyle, the author of the book wrote it with an intention of helping us realize that happiness or unhappiness is all a manifestation of our thought processes and how we tend to view situations. Life is the present moment, and not what did or will happen. However, with the constant pressure of the idea of a perfect life where everything turns out smooth, it is hard not to worry. Through reading this book I’ve realized where my rainy clouds came from – my own thoughts. Don’t get me wrong, it is impossible to decide to think happy thoughts – and actually erase negativity out of your mind. Instead, Doyle advises to allow the thoughts to come, let you observe them and come back to the present moment. When thoughts enter our mind and we allow them to make an impact, we may act on instinct and therefore end up hurting people, taking unnecessary risks etc. – which might seem a great idea in the moment, but are certainly not beneficial in the long term. This book helped me to realize we often act on the fear, memories from the painful past (due to grudges etc) and the obsession of control of the future. Our stress is never caused by the situation, but by believing the stories the mind tells about the situation. Without these stories, there is only this moment, and it is always fine as it is. 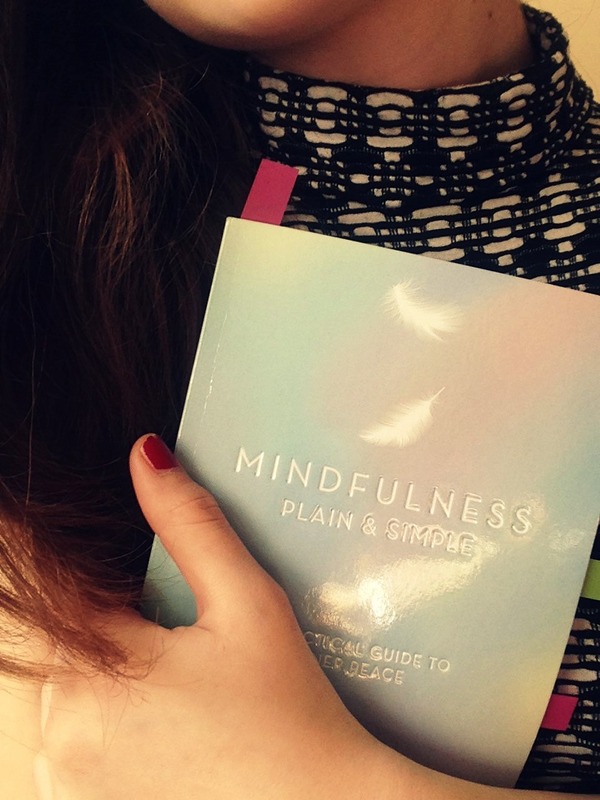 Apart from stories and conclusions deriving from them, Oli Doyle also focuses on exercising your mind through breathing exercises which are included at the end of each chapter. These sound relatively easy at the beginning but turned out to be difficult for such a noisy mind like mine! I truly believe this short and simple book is a huge eye-opener. I never knew how powerful books are until I started reading self-help literature instead of the standard novels. There is so much we can improve on every day, step by step, in pursuit of our own well-being and happiness. Acceptance means learning to see things as they really are instead of viewing them through our preconceived ideas and thoughts. …conditional happiness means believing that we need something other than what we have in order to be happy – putting conditions on our happiness. Hi Karol, that’s very encouraging to read. I’ve been trying to meditate on and off for a while and ‘mm really struggling to feel the benefits as I’m probably trying too hard. I’ll check out the book, sounds like it has helped you. Meditation is claimed to be the hardest thing!! Good luck and yes definitely grab the book if you have a chance 🙂 Thanks for reading!